In honor of its 100th birthday, ASCAP commissioned a short film titled Why We Create Music. The film, directed by filmmaker/composer Michael Marantz, was filmed in 10 different sessions across the country and features 15 songwriters and composers discussing why music is such a crucial part of the human experience. Artists included in the film range from composer Carter Burwell (Coen Brothers) to Ne-Yo, Bill Withers, Dan Wilson, members of Lady Antebellum, Amy Grant and several others. Over the course of the filming, each artist was asked to add his or her own personal touch to a collaborative composition called “More Than The Stars.” Part of the final track became the score of the film, and a full version of the song is set to be released soon. The video is part of ASCAP’s 100 Years, 100 Days campaign, which celebrates the last century of music in America with photographs and memories of important historical events. A new item is revealed on the site’s interactive timeline each day leading up to the PRO’s 100th anniversary on February 13. 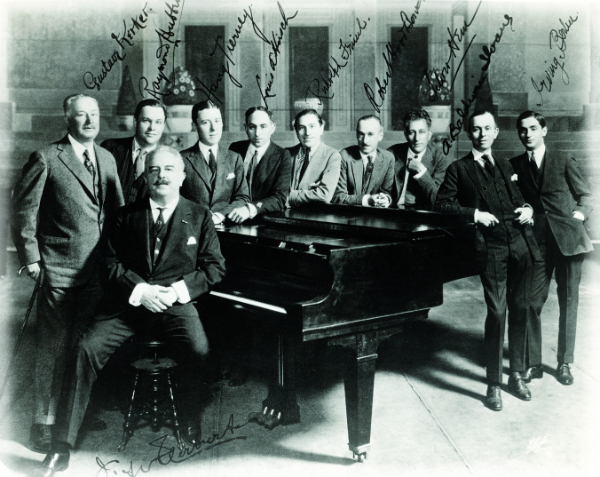 The founding members of ASCAP.